CLA bridges the apparent limits between architecture, landscape architecture and visual arts while combining practice with constant involvement in academia and applied research. Office director Luis Callejas has been faculty at Harvard University Graduate School of design since 2011 and Associate professor at the Oslo School of Architecture since 2016. Having obtained diverse recognition in multiple architecture, urban design and landscape competitions, Luis Callejas was awarded with the Architectural League of New York Prize for Young Architects in 2013 and selected as one of the world’s ten best young practices by the Iakov Cher-nikhov International Foundation in 2010. 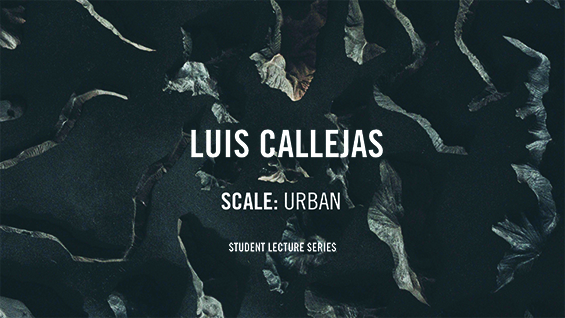 Architect and landscape architect Luis Callejas will present recent work and persistent inquiries between the object and vast territories. The Student Lecture Series is made possible through a generous contribution to the School of Architecture Dean's Circle by Elise Jaffe and Jeffrey Brown. This event is open to current Cooper Union students, faculty, and staff.